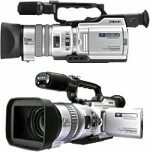 My Digital Cameras - Reviews, Pictures & Information on the Digital Cameras That I Own. Information & reviews of all the digital cameras that I have owned or currently own. The Casio QV-10A was my first digital camera. Back in the early days of AOL they used to offer special deals to their members all the time and you could charge the purchase to your AOL account. I had America Online ship me the camera ASAP. This camera had a whopping 2 megabytes of memory and a maximum resolution of 320x240. Even though this digicam went through AA batteries like crazy and took low quality pictures, it did a great job of capturing some treasured memories from my high school years. My next digital camera was the sturdy Kodak DC280. It had a nice 2 megapixel sensor that produced very vivid colors and sharp images. I was able to print out high quality 8x10 photos with my HP Inkjet printer and Eastman-Kodak glossy photo paper. The DC280 was quite bulky by today's standards but we always found a way to bring this camera along when my friends and I would head out for a night of fun. Fortunately this camera came with rechargeable AA batteries and I bought a second set so we never ran out of juice and could pack the CF memory card to the brim with pictures. My trusty DC 280 is the reason that I remember most of my early college career. So many good times would have been pushed out of my memory by new events if it had not been for this camera. The Canon PowerShot S100 (also known as the Ixus in Europe) was the first of many compact cameras from Canon in the "Digital Elph" line. It also had a 2MP CCD sensor just like my DC280 but this camera was tiny in comparison. Since it was so small and convenient to carry, I took even more pictures with the S100. I think I took over 10,000 pictures with it before I gave it to my brother and upgraded to a newer model. This camera helped me capture just about every good time my friends and I had during our last two years of college. One of my favorite things to do was to hand off the camera to different trusted amigos and let them snap pictures of whatever they wanted during a get together. Then later on we could all look at the fun and wild candid shots they took. Up next is the Canon Power Shot S200, which had the same CCD sensor as the S100 but with much better color and movie mode. The S100 was a great camera but it suffered from "cold" colors where people would look bluish in the pictures. The S200 was more true to life with rich greens and healthy pink skin tones. By far the best feature of this camera was the movie mode that let us capture short video clips. I had to buy a bigger hard drive for my computer to accommodate all my old pictures and all the new video clips that I was filming. The movies came out a bit fuzzy but since the camera also captured audio it was a great way to put yourself back in the moment. When I was in high school, I took photography class for two years. This class introduced me to the flexibility and control that a SLR (single lens reflex) camera lends to a photographer. But I always hated being limited by the small number of exposures available on 35mm film. The Nikon D100 was the first DSLR or Digital SLR offered in the prosumer market. I had to have one of these 6.3 megapixel monsters! With a max resolution of 3008x2000 pixels, the Nikon D100 gave you the power to print poster sized pictures and capture every tiny detail of a moment. The 3 frames per second ability of this camera allowed me to capture excellent action shots of my friends racing their high powered sport bikes around the race track. Admittedly, I deleted most of the 50,000 images that I captured with this camera, but the keepers were of exceptional quality. As far as I can tell, I'm going to be a Canon PowerShot owner for the rest of my life. I have never been disappointed with any of the "Digital Elph" cameras that I have owned or used. The Canon SD110 has a superb 3.2 megapixel sensor with 2.2 FPS capability and an extended movie clip mode. Great for capturing unexpected action videos. A new feature, "Quick Shot", speeds up the picture taking process so that you don't miss that special moment. The SD in SD110 stands for Secure Digital, which are the tiny postage stamp sized memory cards currently being used in most ultra-compact digital cameras. Currently, the SD110 is my main digicam with 1,000's of pictures on the odometer and 1,000s more to be taken. I got this cell phone about a year ago and I truly love it's tiny size and stylish looks. The .1 megapixel camera leaves a lot to be desired but I always have my phone in my pocket no matter what the situation. So when a special moment arises and I have no other way of capturing it forever, I whip out my Cingular (now AT&T, again) Mobile powered cell phone and snap a grainy 352x288 picture that gets saved to the 2 megabytes of internal memory. I purchased the USB connection cable for this camera so I'm able to attach it to my computer and periodically download the pictures for safekeeping. The day that Sony Ericsson comes out with a phone as small and attractive as the T637 with at least a 2 mega pixel sensor, flash and an SD memory card slot will be the day that I buy a new phone. My trusty old Canon SD110 was starting to look very raggedy and the lure of all the new Powershot models was too tempting. I picked up the new Canon SD700 IS for about $300. It features a 6 mega pixel sensor, a 4x optical zoom, a big 2.5 inch LCD screen, image stabilization, and a high quality 640x480 30 FPS VGA movie mode. This camera went along with us on a long trip through South America and the Caribbean. I had the SD700IS in my pocket 24/7 and it captured a majority of the 40,000+ pictures from that vacation. During our Cancun Spring Break trip I had bought a cheap underwater 35mm film camera at a snorkeling center. It worked well enough to capture the experience but I really wanted the ability use a digital camera under water. I ordered the (~$150) Canon WP-DC5 underwater case from the New Egg website for my SD700IS. I tried out the waterproof camera case a few times at some pool parties with friends which resulted in some very funny pictures that everyone enjoyed. In preparation for the South America & Caribbean trip, I also bought the Canon Powershot S3 IS. I knew that I would need its long 12x zoom for taking pictures at zoos, Iguazu Falls, and other natural settings. This camera features a very high quality 30 FPS 640x480 VGA movie mode with stereo sound and a variety of manual and creative controls. The S3 IS also has the same "Image Stabilizer" as the SD700 which allowed me to capture sharp images even in lower light situations. I was very excited when the S5 IS was announced as an upgrade to my beloved S3 with a bigger 2.5" LCD, 8 mega pixel sensor, and most importantly an external flash hot shoe. I waited until the price dropped down from the $499 MSRP and sold my S3 IS on eBay for close to its original cost. Besides a larger EVF (electronic view finder), bigger LCD, 2 more mega pixels and the flash hot shoe, the S5 is just about the same as the S3. Check out my Canon S5 IS Review & Sample Pictures for my opinion of this new camera. The Juniper Springs Canoe Run and it's alligator infested waters claimed this camera. RIP Canon S5 IS. Obviously I had to have a big powerful external flash to go along with the hot shoe on the new Canon S5 IS. When I used to own the D100, I also had the powerful Speedlight SB-800 for a short time. I knew that adding an external flash to the S5 IS would dramatically improve the photographic experience of shooting in low light. I thought about buying the cheaper 220EX flash but that one didn't have a tilt & swivel head which meant no ability to bounce the flash. I inherited a well worn Sony VX-2000 3CCD professional quality video camera from a student travel company that I worked for a few years ago. This "pro-sumer" piece of equipment captures superb video even in low light situations. I've used it on a few occasions to film the weddings of some of my closest friends and then create DVD-R's with illustrated menus, which they have been so thankful to receive. This Canon Powershot SD900 features a strong yet heavy titanium body, a 10 megapixel sensor, and a 3x optical zoom. I got it for free in exchange for my family's old SD110 that suffered from the Sony CCD Recall Problem. When my beat up but beloved Canon SD110 started capturing purple images, I searched the web and found out about the Canon CCD Image Sensor Service Notice. I contacted Canon's online support and they promptly sent me a pre-paid shipping label. A few days later I received this "refurbished" Canon Powershot SD1000 that looks new and works flawlessly. This is my favorite compact camera to take out with me at night because of it's tiny size that fits perfectly into the front pocket of a pair of jeans. By now you probably think I'm a bit crazy for owning so many cameras. I got this Sony DCR-HC20 Nightshot equipped camcorder specifically to capture our upcoming "Sea Turtle Walk" that is hosted by the Gumbo Limbo Environmental Complex in Boca Raton, FL. I bought it for next to nothing on eBay as a "broken camera". The description sounded like the camcorder was suffering from the infamous Sony CCD Recall problem. I sent it in to Sony and they fixed it for free. The infrared "Nightshot" feature will allow me to capture clear video of a Loggerhead sea turtle laying her eggs and then later to see the hatchlings making their way into the ocean. I've been longing for a new camera with "superzoom" capabilities ever since my Canon S5 IS fell victim to a capsized canoe. The Canon Powershot SX230 features a 14X zoom lens (28-392mm equivalent), a 12.1MP CMOS sensor, GPS tagging, 3.2 FPS, and full HD movie capture. I purchased the SX230 HS for $299.99 at Amazon.com in August 2011. For sample pictures from the SX230, check out the following links: Sante Fe Teaching Zoo, Anne Kolb Nature Center, Lion Country Safari, and Museum of Discovery & Science - Ft. Lauderdale.